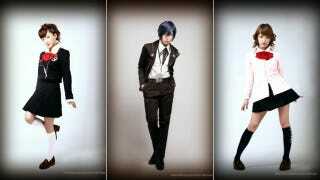 What Do You Think of the Live-Action Persona 3 Actors? Japanese role-playing game Persona 3 is coming to the Tokyo stage. Here's a first look at the cast members in full Persona 3 garb. As JetFusion notes, the stage play is called Persona 3: The Weird Masquerade ~The Blue Awakening~ and opens next January at Tokyo Dome City's Theatre G-Rosso. Persona soundtrack composer Shoji Meguro is doing the score, while scribe Jun Kumagai, who wrote Persona 4: The Animation, is handling the script. The theater isn't a first for Persona. It's previously been turned into a stage show.